Do you want to set up an E-commerce site with WooCommerce and WordPress in multiple languages without getting migraines? Well, look no further! This book will show you the complete process step by step, with nothing but freely available open source WordPress plugins. 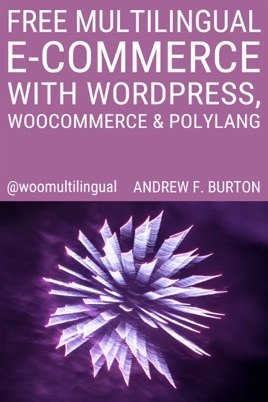 - A step-by-step guide on how to set up a multilingual online store with WooCommerce, the most popular E-commerce solution for WordPress, and the free WordPress plugin Polylang. - With open source code that you can apply directly to your WordPress website. The code snippets are also available for download from a supporting website. - The author is open for feedback, so you can make this book better by contributing to it! You already know the basics of WooCommerce (and, naturally, WordPress), and now you want to create a multilingual store, so you wonder how to achieve that with free WordPress plugins. You're not looking for any dry theory or a WooCommerce general beginner's book, but a practical step-by-step guide. - Step-by-step you create an E-commerce site with WordPress and WooCommerce in multiple languages. - You create a Child WordPress theme and the theme functions.php file, so you can add all the code needed to make multilingual work. - Installing and configuring WooCommerce and create a product that's ready for translation. - Installing and working extensively with Polylang, a free WordPress that turns your WordPress site and your WooCommerce store multilingual. - Fixing issues by adding custom code to your theme's functions.php file. - How to edit WooCommerce language files directly. Have you ever had that feeling of being stuck in an unfulfilling professional life? The author knows this sounds awfully corny, but working with WordPress, and the great open source community surrounding it, gave his life the kick it thankfully needed. Andrew F. Burton received his initial professional training at Zurich Business School, and worked for decades in banking and finance-related industries when he wasn't backpacking around the world way back before the lame Lonely Planet days. When the web came along, he set up an Internet startup soon after the first web browser became popular. However, being an Internet pioneer in a small place like Switzerland didn't quite turn out the way he had wanted it to be, so he switched back to finance. He regrets not moving to the U.S. instead. When he discovered open source CMS and WordPress 3.0 that came out in 2010, he was instantly hooked. Always interested in getting the best out of WordPress for his clients, he now works as an independent consultant for all things Web in Switzerland, a country where being multilingual is part of an everyday life. He loves learning about web technologies, so over the years he has become quite familiar with the classic tools like HTML, CSS, PHP, jQuery, but also more recent ones like AngularJS and Ionic Framework.